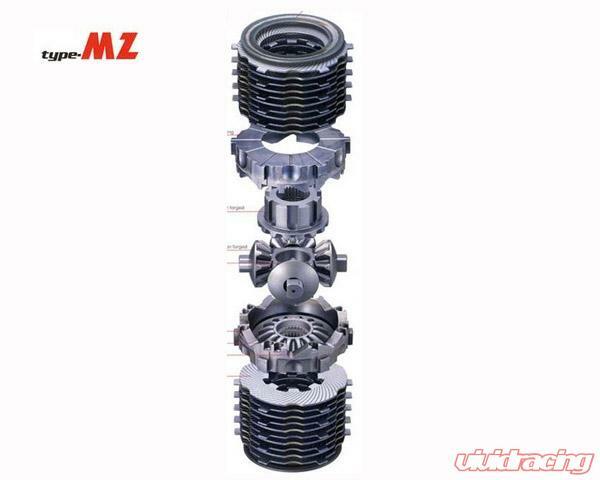 Cuscos Type MZ Limited Slip Differential utilizes clutch discs to provide high initial torque. This is best suited for those who drift and drag race and require solid engagement. With forged internals housed in a chromoly case, this LSD is extremely durable and will serve you well in the most extreme conditions. The clutch discs in the Type MZ has radially cut grooves to allow for instant oil movement. This helps with improving durability and efficiency. Each MZ clutch disc is also polished for even and consistent contact with the pressure rings. Cusco stresses the use of wear resistant parts like their incorporation of the "Oil Through System" by using high quality chrome molybdenium steel. The internal side gears and pinion gears used are precise forged parts that enable compact yet durable gears to cope with high horsepower applications. 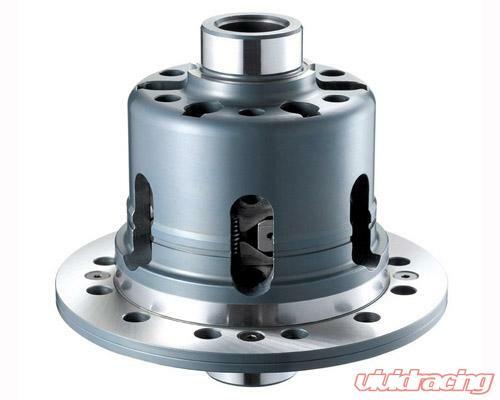 This, in turn, increases the internal oil capacity as well as the number of MZ clutch plates taking the load off each plate for further durability. The Cusco Oil Through System enables stability in high performance LSDs. Cuscos unique Oil Through System enables better oil flow inside the LSD for better efficiency. The casing made from Cuscos unique technology allows the oil to flow from the wide end to the pressure rings and the MZ clutch plate for efficient lubrication. Making the LSD more stable and durable! This was only possible with Cuscos unique technology in manufacturing chrome molybdenium steel casings and gears that enabled a higher level of durability and a better flow of oil due to the large oil openings. 1 way LSD: Specially suited for front wheel drive cars and AWD front axle cars.Activates under acceleration, and acts as a true LSD when the throttle is off. 1.5 way LSD: Activates under acceleration with less under-steer under deceleration than on a 2 way LSD. Recommended for those who want to reduce under-steer. 2 way LSD: Recommended on rear wheel drive cars and AWD rear axle cars. Activates on both acceleration and deceleration. Recommended for those who prefer aggressive driving and big angle drifting. CUSCO has a brilliant record and history in the top categories of track racing, rallying, dirt trials and gymkhana. By staying continuously in touch with each cars potential and character, they can create settings for almost any car. From this experience in motorsports, they developed confidence in their CUSCO brand for street use. The CARROSSER competition products are developed one by one from their broad and long experience in competing in motorsports, and based on their extensive data and know-how. CUSCO responds to those who appreciate such matters, like driving a car or controlling its performance.